Grand Central Terminal stands resplendent in the center of New York City. Photo by Rob Bye on Unsplash.com. 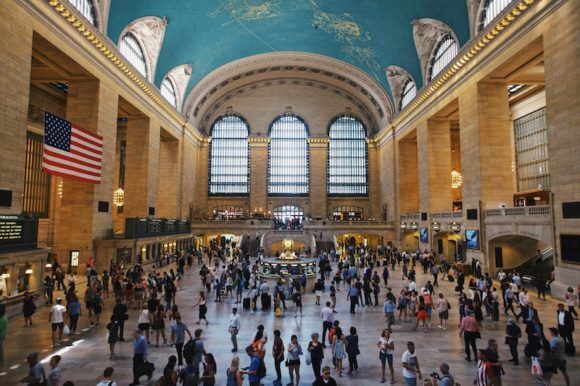 There is possibly no more beautiful railroad station in the world than New York City’s Grand Central Terminal (GCT). As the destination of over 55,000 daily rail commuters from Connecticut, it’s a place where many of us spend a fair amount of time. I’ve been riding in and out of Grand Central for over 50 years. So to help you maneuver the station’s labyrinth of tunnels, ramps and stairs, here are some of the “secrets” of Grand Central that I find most useful. Sure, you can enter Grand Central from street level, but in bad weather you can find your way there underground from blocks away. The north-end access entrances at Madison and 47th St., Park Ave. and 48th St. and the Helmsley Building walk-ways are dandy, though not all open on weekends. But did you know you can also access from 43rd or 45th St., west of Vanderbilt, from inside the Chrysler Building, the Hyatt Hotel on 42nd St. or via the subway’s shuttle station, on the south side of 42nd St., just west of Park? If your train dumps you on the lower level, forget about the ramps or stairs for the long climb to street level, especially with luggage. Walk to the forward end of the train and look for the elevator near Track 112. It’ll take you to the upper level or, better yet, to within steps of Vanderbilt Avenue (see below). Getting to the lower level platforms from street level is just as easy. On the upper level, look for the elevators and take them down to “P” (Platform) level avoid two flights of stairs. The new washrooms at the west end of the lower level have helped a lot, but still there’s often a line. Take the nearby escalators up one level, turn around, and on your left is the Stationmaster’s Office complete with a small waiting room and lav’s … but for women only! Or, go right and just before the ramp up to 42nd St. and Vanderbilt, look on your left for the sign for the Oyster Bar. Go down the steps into the bar and you’ll find ornate bathrooms known only to a few. Forget about the long line at the taxi stand on 42nd St. east of Vanderbilt. Instead, go out the west end of the Main Concourse, up the stairs and out onto Vanderbilt Ave. Cross the street and wait at the corner of 43rd. Taxis flow through here, dropping off passengers every few seconds. If you’re heading west you’ll avoid the traffic on 42nd Street too. Want to enjoy a cigar before your train? Forget about lighting up anywhere inside the station. Instead, go to the Hyatt Hotel just east on 42nd St. From street level, go up two levels by escalator to their taxi stand and you’ll find yourself on the raised Park Avenue as it wraps around GCT. These are a few of my favorite “hacks” of Grand Central. Drop me an e-mail with yours and I’ll include them in a future column.